Like the rest of the world, Barrett-Jackson was profoundly shocked and saddened by the tragic Oct. 1, 2017, shooting at the Route 91 Harvest country music festival in Las Vegas that left 58 people dead and hundreds of others injured. The tragedy hit very close to home for the Barrett-Jackson team, which was preparing for the 10th Annual Las Vegas Auction to be held just days later at “ground zero” where the horrific event took place. It was an incredible moment at the 2017 Las Vegas Auction when the hammer dropped on a $1 million bid on Barrett-Jackson President Steve Davis’ 2007 Ford Shelby GT500 Super Snake, 100% of which has benefited Las Vegas first responders. Davis and his wife Janie discussed what could be done, and decided to donate their personal 2007 Ford Shelby GT500 Super Snake – a rare 40th Anniversary Edition and the 11th manufactured that year – to be auctioned at the Barrett-Jackson Las Vegas event, with 100% of the sale price going to the city’s first responders through the Injured Police Officers Fund (IPOF). 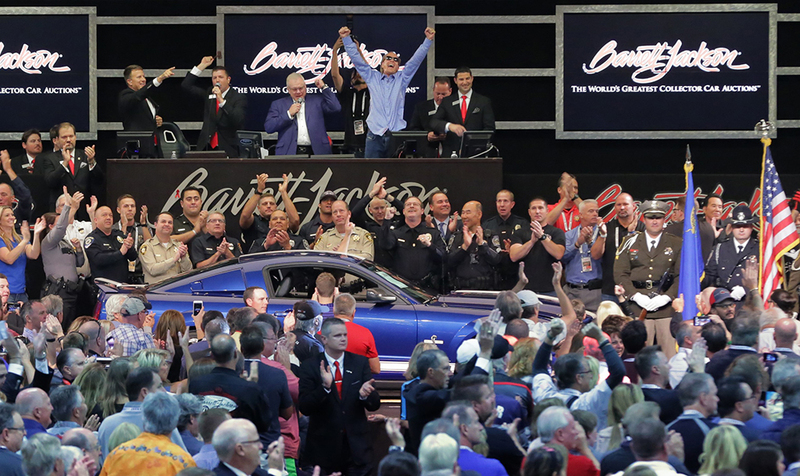 The sale ended up being one of the biggest – and most emotional – moments in the nearly 50-year history of Barrett-Jackson when DC Solar, led by COO Paulette Carpoff and President/CEO Jeff Carpoff, had the winning bid of $1 million. The IPOF graciously stepped forward and offered to manage the funds, which Davis wanted to make sure went to a wide variety of deserving organizations throughout the Las Vegas community. “I believe it was unprecedented to select one charity to be the overseer and distribution hub,” says Davis. “The IPOF formed a committee and did a comprehensive analysis, and distributed the money in a way that positively impacted the community at large, which is very, very satisfying. “We spent six months selecting worthy organizations as the recipients of this generous and much-appreciated donation,” said Lieutenant Erik Lloyd, President of the IPOF. “There are so many deserving first responder organizations, and we made every effort to donate to those in our community that are on the front lines of law enforcement, rescue and safety in Nevada.” One-half of the funds from the sale was distributed to local firefighters, trauma personnel, EMTs and security officers; the remainder will be used by the IPOF for future distribution to the families of officers injured or killed in the line of duty. DC Solar’s Paulette and Jeff Carpoff with representatives from the Injured Police Officers fund and the 27 Las Vegas community organizations that benefited from the sale of the Super Snake. The Super Snake was not the only car from the 2017 Las Vegas Auction that went on to help others affected by the tragedy. NASCAR Foundation Chairman Mike Helton stepped up and donated his 2016 Jeep Wrangler Red Rock Edition – one of less than 50 special-edition Wranglers built by Jeep – to benefit the UNLV School of Medicine Department of Emergency Medicine Residency Program Fund. With Helton and NASCAR Hall of Famer Rusty Wallace onstage, the rare Jeep crossed the block and raised $100,000. 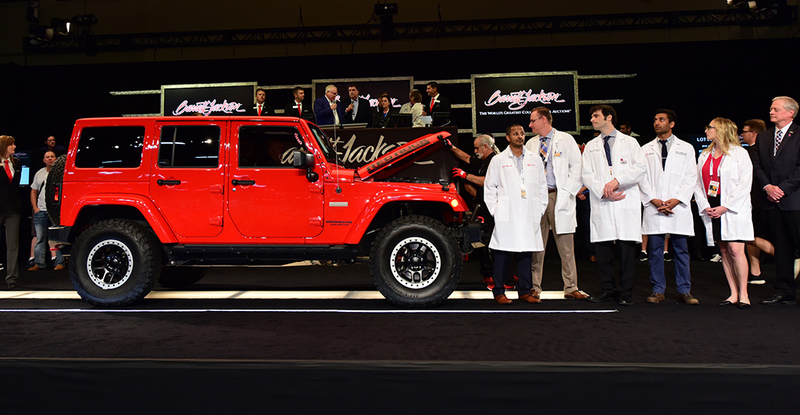 With NASCAR Foundation Chairman Mike Helton and NASCAR Hall of Famer Rusty Wallace onstage, Helton’s rare 2016 Jeep Wrangler Red Rock Edition crossed the block and raised $100,000 for the UNLV School of Medicine Department of Emergency Medicine Residency Program Fund.